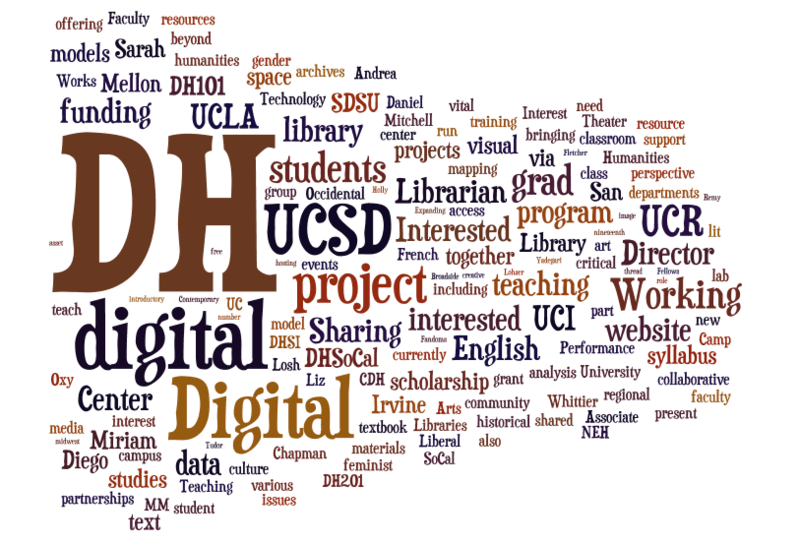 A few years ago, at THATCamp SoCal, a handful of us generated the idea for a regional Digital Humanities network. Since then, the idea has gained momentum and we now have affiliates from nearly every university campus in Southern California represented our group. I made the Word Cloud, above, from the notes of our latest gathering at UCSD. As you can see from the Wordle, there are several key topics that emerged: teaching, projects, syllabus, students, data, funding, program. What struck me the most from this are the words “interested” and “sharing” which point to how each attendee came to the meeting seeking a better understanding about how DH is being taught and practiced at other institutions and is interested in sharing what they are doing at their own. She was told never to do these 5 things while she was getting a PhD in History, but she did them anyways. Click here to see what happened.